What strikes you about Dale Steyn? If you told us that we had to use a tired cliché to describe the effort that Dale Steyn puts into bowling or you’d force us to do a dance in front of other humans, we’d hang our head, sigh softly and mutter “sinew-straining”. Dale’s certainly wholehearted. Perhaps too wholehearted. The staring eyes betray a love of caffeine the like of which we haven’t seen since everyone in the office got caught in a nasty espresso-drinking cycle last year (you needed the pick-me-up in the morning after yet another nervy, sleepless night). Whatever it is, Steyn skitters in, looking ever-so-slightly-deranged, and whips the ball through with a bit of away swing. It’s not a bad stock ball. Only Ian Bell was really up to it, but Steyn lodged a mirror image of the delivery in amongst his stumps by way of a reprimand. 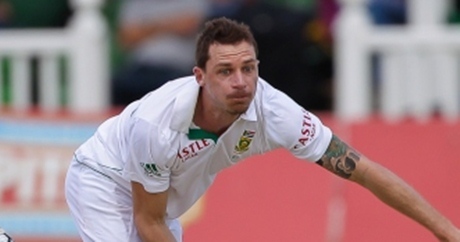 Can Steyn, Ntini and Morkel prey on mental frailties? Indeed, you could imagine Dale Steyn and KP holding a “Red Bull Death Match”. Dale Steyn would dteam in and bowl well over 90 mph, but by the time he was in his delivery stride KP would already be half way down the wicket trying to steal a quick ssingle to get off the mark. Still no sign of Spiderman. If I may be so bold to make an off topic comment here – for those of you looking for some distraction from the English troubles in the current match, and concerned about the future of the Test cricket in India, check out the live commentary of one of the best Test matches ever played on Indian domestic cricket. The Ranji trophy final match was played to full house for 4 days, and my beloved Mumbai won the match by 6 runs. Check out the emails from the readers to gauge the interest of general public in the match. This proves that future of test cricket is secure in India. As long as BCCI creates pitches that are conducive to a contest between the bat and the ball, and not just batting marathons, people WILL flock to the grounds and follow the matches on TV. Sorry for getting all serious here. What can I say, I don’t have a blog of my own so I have to post where I am allowed..
Chowkster, good news is always welcome. Every day brings a surprise. I was introduced to this wonder drink by a South African workmate. I wish I hadn’t been. But then, I generally don’t approve of tea that isn’t tea. They should have the right to call it tea. I mean, that’s like me taking a mug of Horlicks and calling it beer. Chowkster – great stuff. Thanks for highlighting that. There is hope. KC – good use of cliche without using cliche while using the cliche. Very post modern. Thanks D Charlton. Sometimes a cliché is spot on, but people have cliché blindness, so you have to mention dancing to ensure that they pay attention. completely unrelated, but I’ve missed Hayden, so you must excuse me as I attempt to spread my joy at his return. ^ that was a good match indeed. Karnataka should shoot themselves for losing it like that. What a catch. Glenn McGrath took one like that once, completely air-born. yeah, remember that. feel outfield catches like these are always a bit harder (and maybe “better”) than the sudden-reflex catches taken close infield. Dale Steyn was fabulous in this test. Such a wonderful delivery he produced in this test as well as good team work of the South African players..
What can Australia do with their fortnight off?